If you own a property that you rent out, you should know that besides the prospect for ongoing income and capital appreciation, such investments offer deductions which can reduce the income tax on your profits. However, what type of property investor are you? If you have been actively looking for housing properties to purchase and selling them at a profit, you may not be a passive investor. It is likely that you could be regarded as a property dealer or trader. The profits derived by a property trader are taxed as income from a business whereas that derived by passive investor is treated as a capital gain and will be subject to a 5% real property gains tax if the property was held for less that five years. If held longer, there will be no tax. The law to determine whether you are a property trader is imprecise and the outcome can depend on a subjective evaluation of the relevant facts. For example, does it mean that if you have sold a property within a two-year period, you will be a property dealer? Not necessarily, since it depends on your intention when you acquired that property and the reason why you sold it. The sale of a second property will reduce the strength of a claim that you are not a property dealer but again, there may be reasons to enable you to argue otherwise. The money that you receive for rent is generally considered taxable in the year you receive it, even when it is not due or earned. You should therefore include advance payments of rent as income even though they are not due. Expenses paid by your tenant are considered income to you. This would include, say, an emergency repair to an air conditioner while you are out of town. You can then deduct the repair payment as a rental expense. Your tenant might offer his services in exchange for rent. You must include as income a fair market value of his services. For example, if your tenant, an accountant, agrees to help you prepare your accounts in exchange for two months rent, you must include the two months rent as income even though you did not actually receive the money. Such deposits are not taxable on you when you receive them if the intent is to refund the money to the tenant at the end of the lease. If the tenant breaches his lease terms, then you are entitled to use the deposit to make good any defects in the property and return the balance to the tenant. You must include the amount used to repair the defect as income and at the same time claim the amount spent as a deductible expense. Owners of rental properties should not assume that anything done on the property is a tax-deductible expense. The tax law looks at it quite differently. A repair keeps your rental property in good condition and is therefore deductible in the year you incur the expense. Improvements, on the other hand, will add value to your property and the costs are not deductible. Improvements could include a new patio, a garage or a new roof. From a tax standpoint, you should carry out repairs as the need arises rather than wait until the problem becomes such as to require extensive renovations where elements of improvements would invariably be present. If you bought a dilapidated property and immediately incurred repair expenses on it, these “initial” repairs are not deductible, being of a capital nature. Expenses incurred to obtain a mortgage are not deductible. These could be appraisal fees, commissions or legal fees. When you start making your mortgage payments, the amounts paid relating to your rental property will only be deductible to the extent of the interest portion. This would be ascertainable from the annual statement, which your bank will send you. You will also be able to deduct the cost of insurance on the rental property as well as assessments and quit rent. The Inland Revenue Board (IRB), in its public ruling, states that “Where in conjunction with the letting of a property, a person also provides ancillary or support services/facilities, the letting can be considered a business source of income …” The consequence is that you are entitled to claim “capital allowances” on any plant and machinery used in the business of letting. These could include air conditioners, refrigerators as well as furniture and fittings. Should the tax-deductible expenses in any one year exceed the rental income, then the excess being a business loss can be carried forward. The IRB can be reasonable (based on the law) in deciding on the items you can deduct but you need to show them that you have adequate records of the expenses. Always be prepared to back up your claims. Kang Beng Hoe is an executive director of Taxand Malaysia Sdn Bhd, a member of the Taxand organisation of independent tax firms worldwide. The views expressed do not necessarily represent those of the firm. Readers should seek specific professional advice before acting on the views. Olympia Industries Bhd's wholly-owned subsidiary, City Land Sdn Bhd, has entered into sale and purchase agreements for the disposal of 14 pieces of freehold land measuring 21.38 hectares in Melaka to Starwatt Engineering Sdn Bhd for RM42 million. In a filing to Bursa Malaysia today, the company said the proposed disposal was in line with Olympia Industries' restructuring exercise to reduce its total debts. Unsecured Loan Stocks (nominal value amounting to RM12.6 million) and 2007/2013 Irredeemable Convertible Bonds (nominal value amounting to RM21.3 million), is made before April 21, 2011," it said. The proposed disposal is expected to reduce the group's gearing position to 0.49 times from 0.53 times. Olympia Industries will make a gain of RM0.96 million from the proposed disposal. The company intends to utilise the proceeds from the proposed disposal to redeem the existing encumbrances of RM33.9 million. The balance will be used for working capital requirements of the group. The timeframe for full utilisation of proceeds is expected within a year after the completion of the transaction. The proposed disposal is expected to be completed on or before March 31, 2011 or the extended date of completion by the end of April 2011. KPJ Healthcare Bhd, Malaysia's leading private healthcare provider, is on target to open four new medical centres by 2012 to add to its stable of 20 hospitals. KPJ Healthcare, a member of the Johor Corp Group, is expected to spend nearly RM500 million on the hospitals in Bandar Baru Klang in Selangor, Pasir Gudang and Muar in Johor, and Sabah Medical Centre in Kota Kinabalu. Its managing director, Datin Paduka Siti Sa'diah Sheikh Bakir, said it had other hospitals in the pipeline but they would be built later. "The construction of the four hospitals is in progress and the Klang hospital, which costs nearly RM100 million including equipment, is expected to open next year. 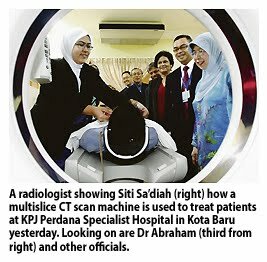 "The RM200 million Sabah Medical Centre and the Muar and Pasir Gudang hospitals, which cost RM70 million and RM90 million respectively, are expected to open in 2012," she told reporters in Kota Baru, Kelantan, yesterday. Siti Sa'diah was speaking after the presentation of the Malaysian Society for Quality in Health (MSQH) accreditation to its hospital, Perdana Specialist Hospital, and the subsequent change of its name to KPJ Perdana Specialist Hospital. KPJ Perdana is the ninth hospital in the group which has received the international-standard accreditation. The others are KPJ Ampang Puteri Specialist Hospital, KPJ Johor Specialist Hospital, KPJ Ipoh Specialist Hospital, KPJ Damansara Specialist Hospital, KPJ Selangor Specialist Hospital, KPJ Seremban Specialist Hospital, KPJ Kajang Specialist Hospital and Kedah Medical Centre. Siti Sa'diah said it had targeted four hospitals to achieve the accreditation this year and had managed to do so. "We hope to get another four hospitals to receive the accreditation next year," she said. The accreditation was presented by MSQH chief surveyor Dr Mary Abraham to the chairman of KPJ Perdana Specialist Hospital, Aminudin Dawam.